Drive Bays: (8) 3.5" HotSwap SATA, (1) Slim Floppy, (1) Slim CDROM, Dimensions: 3.5"(H) x 19"(W) x 28"(D), 600W Zippy PSU, Rails included. The ESR-208 is a EIA310-D standard 2U chassis design that balances what is possible and what is needed. It supports most form factor server boards in the market from Single Pentium 4 or AMD Athlon, Dual AMD Opteron, and Dual Clovertown/Penryn Server Boards in a high density and cost-effective enclosure. 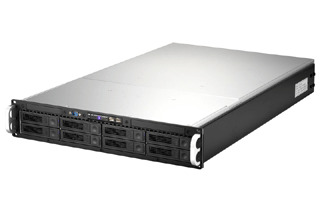 The ESR-208 storage server chassis deliver technology that differentiates your company by helping you to create integrated competitive solutions that win.